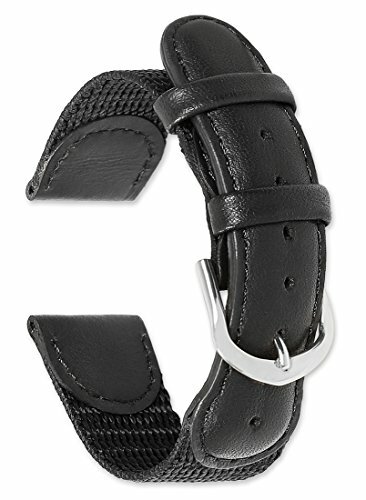 Classic, Swiss Army style 19mm watch strap with a mix of nylon and calfskin. 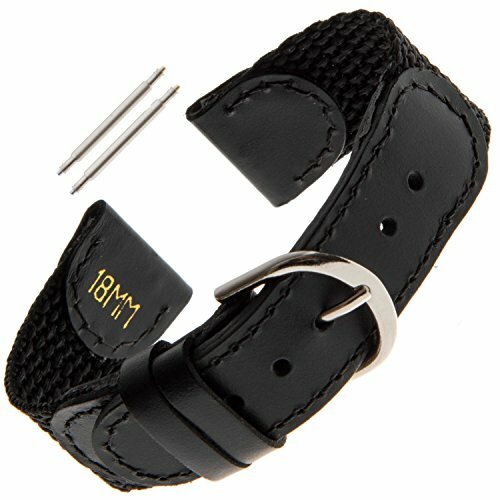 A great replacement strap for Swiss Army watches but may be worn on other models, too. 7 3/4" Long. Silver buckles only. 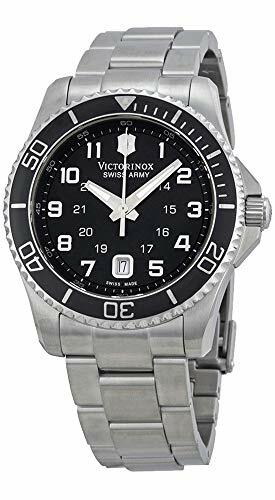 The tough style and durable build of the Victorinox Swiss Army Men's Maverick Watch is sure to look great with any casual attire. The round, silver-toned stainless steel case has a polished finish and is topped with a black bezel. The unidirectional bezel features a tachymeter, silver-toned Arabic numerals, and minute markings. The black dial is easy to see with luminous, silver-toned hour and minute hands, a silver-toned second hand, and silver-toned Arabic numerals at each hour position with the exception of the six and twelve o'clock positions. 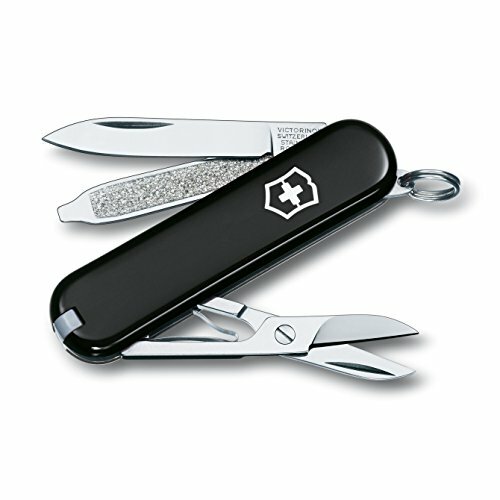 A date window is displayed at the six o'clock hour and the Swiss Army logo is displayed at the twelve o'clock hour. The silver-toned stainless steel bracelet securely fastens with a fold-over-clasp-with-safety. 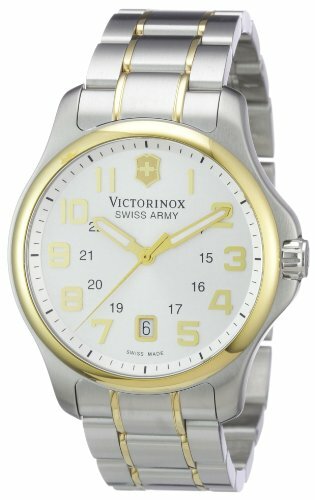 This timepiece boasts reliable Swiss quartz movement and is protected by an antireflective sapphire crystal. The watch is water resistant to a depth of 330 feet (100 meters). This brown leather accented Swiss Army style watch band is a good choice for a standard dress watch. The brown leather has a matte finish and is stitched, but not padded,so the watch band sits flat on your wrist. 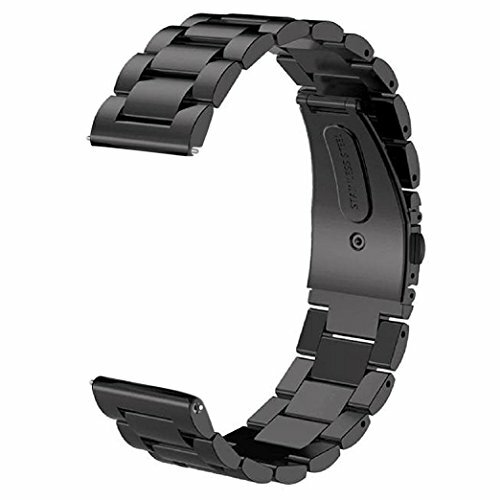 The band features a sliver tone stainless steel buckle that makes the band size adjust easily at any time. The leather is soft and flexible, requiring very little or no break-in period. MaterialItalian grain oil tanned leather and high-quality nylon. 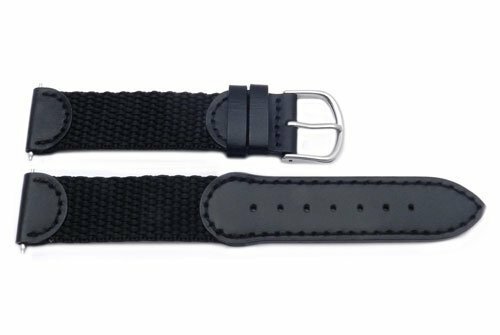 Width: The width of this brown leather and navy blue nylon strap is 24mm.Please confirm your width before buy it (picture 5).And the buckle width is 22mm. Length: Men's regular---75*120mm. You could find more info of length and wrist range from picture 6.If you want the extra long of the same style, please search B07BP4TVF7 in amazon.Q:Why the taper down one only have 24mm width? A:The strap is only have 16mm/18mm/20mm/22mm before. So what we want to do is filling the 24mm size of it. But after we make it as same as before(no taper down), It doesn't look very good because 24mm is wider than other size.Then the taper down one was "born".They still are the same band. For comparison, we make two option. 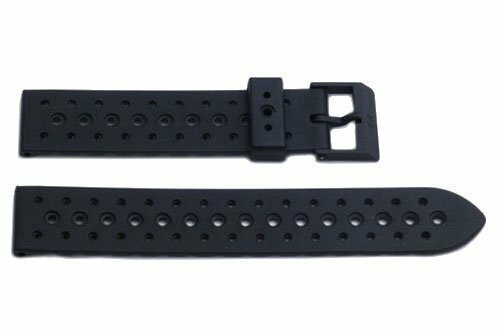 Classic Swiss Army Style watch strap. Nylon and leather construction.